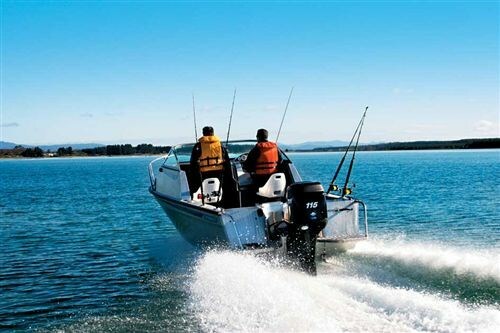 After 21 years in which it’s become something of a New Zealand icon, Hamilton’s Ramco Boats has revamped its line-up with a new generation of aluminium family fishers. The new boats – starting with the 1700 Capri – are poised to extend the legacy. Lawrence Schäffler reports. Ramco – one of the country’s largest aluminium boat manufacturers – came under new management in 2003. While acknowledging the exceptional popularity of stalwart designs such as the Fisherman 570 and 600, the new team recognized the fleet needed a fresh look that would carry the company’s momentum forward for – well, another 21 years. Says general manager Don Good: "The bulk of the existing designs dated back to the 90s. We wanted to improve the aesthetics, give the boats better sea-going performance – particularly in heavy weather – and give fishermen more room in the cockpit." To translate that vision into reality, Ramco commissioned Nelson’s Scott Robson, one of the country’s best known designers. "With his extensive racing background and small-boat knowledge," says Good, "we were confident he was the right man for the job." The Capri 1700 (17’6") is currently the smallest of Robson’s new designs – there is also a 2100, a 2900, a 3200, a 3800 and work has just started work on a 3400. Good calls the bigger designs the "export boats" (it just so happens that most of them are for offshore clients) though they are, of course, also available locally. 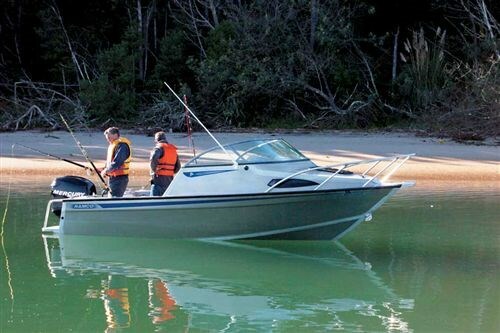 The 1700 (available as a cuddy or hardtop) made its debut at last month’s Hutchwilco Boat Show in Auckland, and it’s already drawing plenty of interest. Measuring 5.88m overall, it’s probably the logical replacement for two, earlier Ramco models – the Fisherman 570 and the Outsider 560. At face value, the key difference between the Capri 1700 and those models is in the beam. In keeping with the design brief for more cockpit room, Robson has given the Capri a beam measuring 2340mm (against the Fisherman 570’s 2100mm and the Outsider 560’s 2115mm). And the effect is obvious – it is a very spacious cockpit – with plenty of room to accommodate four fishermen in comfort. It’s also aesthetically effective – the extra beam is nicely absorbed into the boat’s lines. 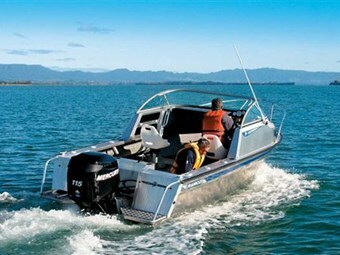 Maximum freeboard is 777mm – there is no sense that the boat’s too "squat". But perhaps the most significant change ushered in by the Robson design is the use of planing strakes on the hull. A departure from the traditional "clean bottoms" of the earlier Ramco boats, the new hulls sport welded strakes. "We specifically opted for ‘welded’ rather than ‘pressed’ strakes," says Good, "because it gave us more flexibility in tweaking the strakes’ positions for optimum performance." I suspect there’s also an element of improved strength in the decision: the strakes are constructed from 4mm aluminium angle profile – they exude strength. So in addition to its pronounced beam chine (1885mm across), the Capri carries two "staggered" strakes per side – an inner one that runs from the stem about two thirds of the way down the hull, and an outer one that runs from the midway point to the transom. Robson has also increased the deadrise over that of the earlier models – to 20o. Both the Fisherman 570 and Outsider 560 have a deadrise of 17o. Collectively, the sharp chine beam, the strakes, the fine entry and the more pronounced deadrise contribute to an exceptionally surefooted performance: the boat corners like a scythe, with nary a hint of slippage. Like its predecessors, the Capri is constructed from marine grade aluminium. But where the Fisherman and the Outsider use 4mm and 3mm material for the hull and sides respectively, the Capri’s design has been beefed up considerably – to 5mm and 4mm. Good is emphatic: "We wanted to boost robustness and sea-going ability – these are user-friendly boats but they must be able to withstand the knocks that come with New Zealand conditions." As might be expected, the thicker material makes for a slightly heavier boat – the Capri weighs 650kg (hull only) versus the Fisherman 570’s 600kg and the Outsider’s 500kg. Not that this appears to have had any impact on performance – the 115hp Mercury Optimax propels the Capri onto the plane in a trice, and with the exceptionally light hydraulic steering, the boat’s a pleasure to maneuver. More on performance in a minute. Construction also incorporates two built-in flotation tanks, ensuring that the boat meets CPC-certification. If there’s anything that underscores the Capri’s design as a tough, heavy weather candidate, it’s the generous array of grab rails scattered around the cockpit. There’s one integrated into the inside edge of the curved windscreen, another along the top edge of the cabin entrance, and still another on the port side for nervous passengers. Skipper and passenger sit on a pair of pedestal-mounted swivel seats. 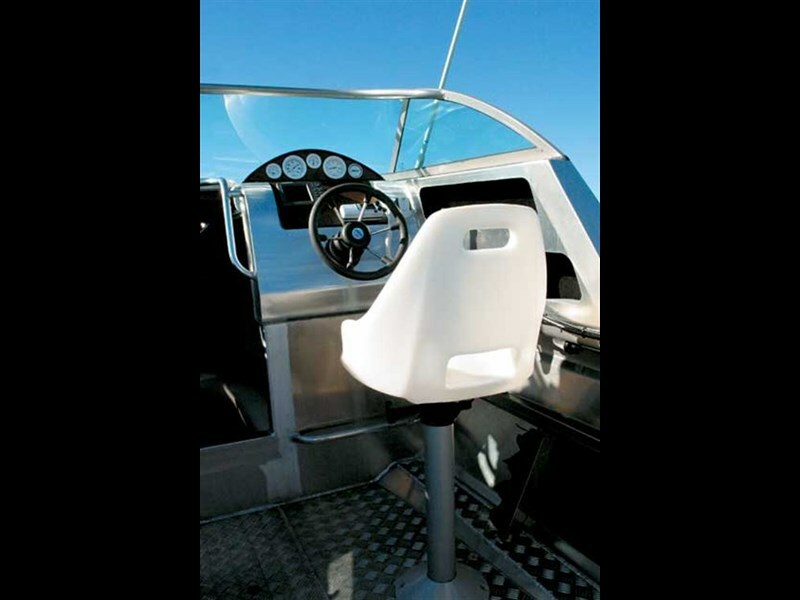 In keeping with the boat’s tough but functional styling, the seats are manufactured from heavy-duty polypropylene. There are two more (vinyl-covered) seats built into the aft ends of the cockpit. They’re easily removed to give fishermen/divers/skiers easier access to the stern area and boarding platforms. A bilge locker is built into the treadplate sole (between the pedestal seats). It’s complemented by masses of storage space around the cockpit. Starting at chest level, there is a pair of carpet-lined pockets built into the cabin’s port wing, with a similar pair next to the skipper. Full-length side pockets (also carpet-lined) are built under each gunwale, and below each of them is an array of holders for four rods (eight in total). The transom’s designed around a recess for the engine, and a variety of watertight lockers are incorporated into the inside sections. Within the central transom locker is a trio of battery switches, and in a port locker, a pair of batteries. A 500gph Rule pump nestles in the bilge under the engine recess. The fabricators, incidentally, have taken lots of care to finish the transom properly – with its clean corners and curves you’re unlikely to disembowel yourself while wrestling a kingi over the stern. And speaking of fishing, there are three rod holders on each gunwales – as well as four cup holders to keep your coffee on an even plane. It’s easy to step over the transom and on to the boarding platform, so the boat’s quickly adapted to skiing/diving mode. A telescopic, stainless steel boarding ladder is fitted to the port platform. The filler cap (on port transom) leads to a 90-litre, underfloor fuel tank. A curved, acrylic windscreen adorns the forward end of the cockpit, and without the traditional centre support truss, it offers good, unobstructed visibility. Standard Mercury instruments are mounted on an imitation wood grain fascia. Our Capri was also fitted with a Lowrance X102 fishfinder/depth sounder and a Uniden VHF. A stereo/CD player is mounted inside the cabin, within easy reach of the helmsman. Generous cockpit space is complemented by a fairly roomy cabin. It’s equipped with the standard V-configuration of squabs (two-tone vinyl) with storage lockers underneath. Cabin sides, ceiling and floor are covered in carpet – a feature that helps to mute hull sound. Light comes in through a large, Slimline access hatch, and two side portlights (non-opening). The generous cabin forces a compromise – there’s no access to the foredeck around the cabin sides, so anchor duties take place from the access hatch. Once you’ve ventured on to the foredeck, however, your security’s enhanced by a full, wraparound bow rail. A short bowsprit with roller is mated to a tie-off cleat, with the anchor locker behind. The locker offers plenty of space, but its cover is disappointing – it’s pretty rough and fits poorly – and detracts from the workmanship evident elsewhere in the boat. I’d substitute one of the plastic hatch covers used on many other aluminium boats. Navigation lights (port and starboard) are mounted on the cabin sides, with a pole light for the rear. 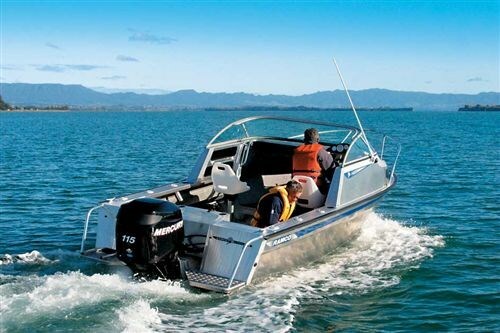 The review boat was supplied by Tauranga’s Bay Marine, and managing director Graham Cave says he supplies it with a Voyager unbraked tandem trailer and a road cover. As suggested, the 115hp Optimax makes for a happy marriage with the Capri – the package presents good balance and trim. Maximum recommended horsepower rating is 150, but frankly, I can’t see the need to go any higher. The boat accelerates effortlessly and planes quickly. I pushed her into tight, high-speed turns, and she held her line without quibble. We had a little cavitation in the turns early on, but a little tilt down on the Optimax sorted that out quickly. At 5500rpm (full tank and two adults aboard) the boat did 47mph (on the Mercury gauge) and at WOT (5800rpm) it reached 50mph. It’s no slouch. The Capri 1700 offers attractive lines, lots of space, good performance and an overwhelming sense of solid, no-nonsense construction. I’m sure it – and its sisters – with the refinement they present, will be worthy and popular successors to the early Ramco models.